The Ginkgo is a majestic shade tree, with a broadly spreading canopy full of light-green leaves that turn gloriously golden in fall. It is excellent for urban planting, as either a street tree or as a featured specimen in the landscape, due to its fine ability to adapt to all types of soil conditions, to drought, and to air pollution – and to the useful fact that it is insect and disease resistant! Ginkgo is a “living fossil”; it was growing when dinosaurs roamed the earth more than 200 million years ago. Fossils of Ginkgo have been found in rocks dating back to the Jurassic Period – and its form has remained essentially unchanged since then. While it is prized for its beauty and heartiness, it stands out as a botanically unique tree which has no known living relatives. Its full botanical name is Ginkgo biloba, but this native of China is usually known simply by its genus name, Ginkgo – which is derived from the Chinese word (pronounced yingua) meaning “silver fruit”, referring to its 1” diameter fruits which are yellow but reflect a silvery sheen. The specific epithet, biloba, refers to its bilobed, fan-shaped leaves. Its common name is Maidenhair Tree, because the leaves resemble those of Maidenhair Fern. Because of the way Ginkgo is pollinated, it is technically classified as a conifer and is dioecious, meaning that there are male and female trees. Most people plant grafted male trees, since the females drop messy, foul-smelling fruits! For centuries in China and Japan, Ginkgo has been used for its medicinal qualities and for food. The roasted nuts are considered a delicacy, but can be toxic in large quantities and if not prepared properly. It is commonly used for Japanese bonsai. 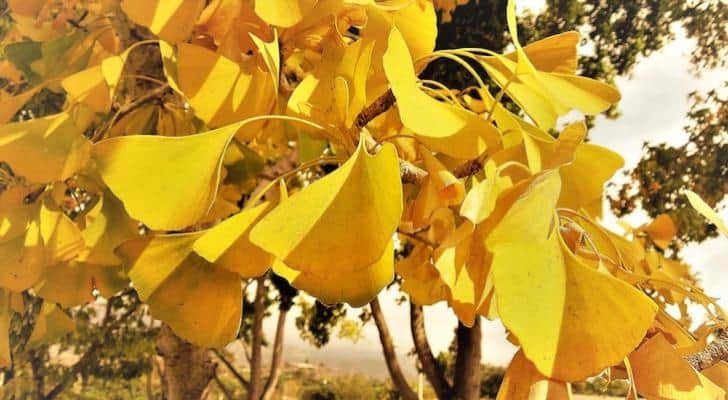 The most popular Ginkgo variety grown in the Santa Barbara area is “Autumn Gold”. Selected for its brilliant fall color, it grows quickly (at a rate of 1’ to 2’ per year) and up 40’ tall, with a spread of 25’. The leaves are up to 3” across and resemble a hand-held fan. The attractive light-beige bark becomes deeply furrowed on older trees. Ginkgo does best in full sun to partial shade and in well-drained loamy soil. Once established, it can survive on our natural average rainfall, but benefits from monthly deep watering in the dry season. 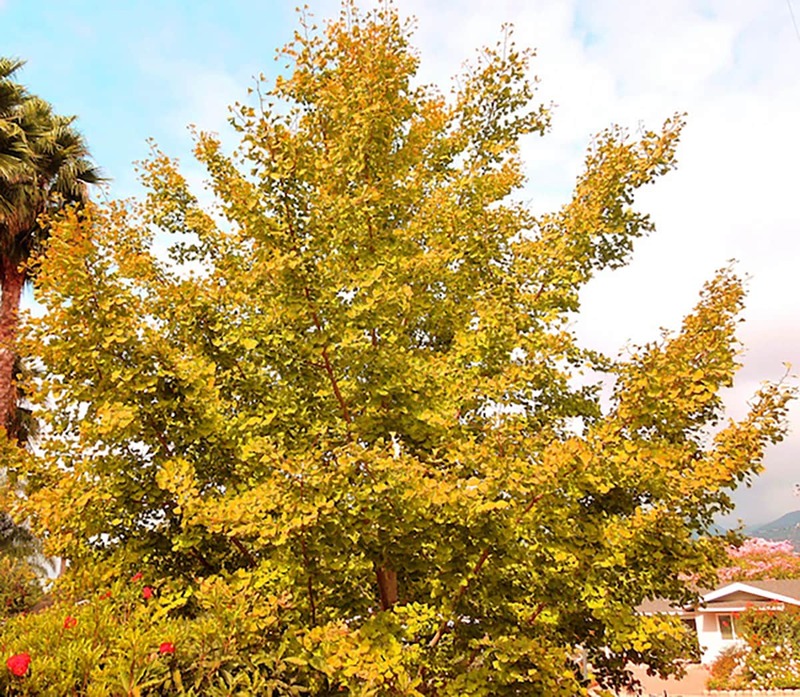 Ginkgos are found as street trees on the first block of East Quinto Street, Torino Drive, and on La Cumbre Lane – and are planted as landscape trees in Alice Keck Memorial Gardens, East and West Alameda Park, Willow Glen Park and Lower Orpet Park. Beautiful private garden Ginkgos can be seen on Grove Lane.